The Complete Filing and Paper Management System for an uncluttered space and an uncluttered mind! It can seem like a never-ending battle trying to organize office drawers or other storage areas. This desktop filing shelf is the solution to all that clutter and stress. Instead of letting things pile up, arrange different papers, folders, files and binders as you like. With 6 vertical shelves and 2 horizontal shelves, you won't be lacking in space! Once you start using this amazing desk file holder you will wonder how you ever managed without it! ✔ Ideal for the Office - Perfect for keeping memos, faxed documents or notebooks and files in one place. Every office should have at least one of these in a central place. ✔ Great for Home Organization - The bane of every parent is when their children bring home papers, project, homework assignments and forms to sign. Get your kids onboard with home organization by filing everything neatly on this shelving system. ✔ Perfect for Teachers - Teachers always have papers everywhere, whether its homework assignments or test papers, book reports. every teachers desk should have this filing system. Helpful for both students and teachers. ✔ No Assembly Needed - No screwing, drilling or tools needed. You can use this desktop mesh organizer right out of the box. ✔ Easy Access to All Your Documents - Having all your papers neatly arranged in vertical shelving, ensures that nothing gets mixed up together. Each file or binder just slots neatly into its own place. Get rid of the clutter and expand your mindspace by just by scrolling up this page and placing your order today! ► CONVERT YOUR OFFICE INTO A CALM & PRODUCTIVE SPACE - Cluttered and messy desks with files and papers all over the place creates stress makes you feel disorganized and less productive. Create a convenient filing system using this stylish file folder holder with eight-compartment, so everything will always be in its place. ► MADE WITH HIGHEST QUALITY, EXTRA DURABLE MATERIALS - The black metal mesh can hold even the heaviest of binders. Additionally, it is made with a smooth ABS overlay coating. So, the desk file shelf will look great on your desk. The 4 non-skid rubber foot grips protect your furniture and prevents the file holder from slipping. ► EASY ACCESS TO ALL YOUR STUFF - Whether you work from home or homeschool your kids, this letter file, folder organizer makes it easy to find what you need. use the two horizontal bottom trays to slide papers and books in and out while the additional six vertical sections sort your letters and folders to increase efficiency and productivity. ► THE TEACHERS & BUSINESSMAN'S BEST FRIEND - Are you a teacher who finds your desk gets way too cluttered with students homework assignments, papers, projects and tests? 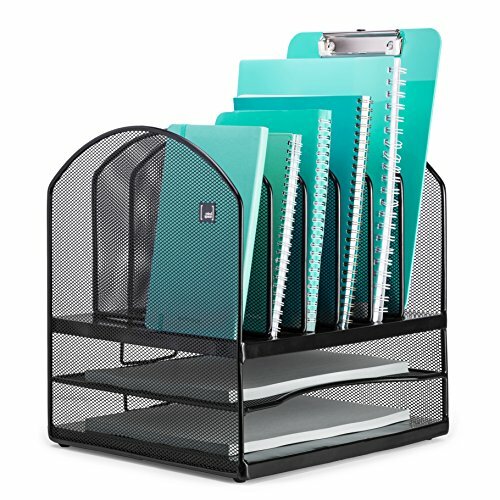 then this two-tier file organizer with vertical slots is your best solution! You can place folders on the bottom shelves and binders in the top slots. Stay organized all year long. ► CONVENIENCE IS KEY - NO SCREWING, DRILLING OR TOOLS NEEDED - You can start using this desktop mesh organizer right out of the box, no assembly needed - It comes fully assembled so you can start feeling organized and productive right away. This paper file folder will look smart and stylish in any home or office. If you have any questions about this product by Mindspace, contact us by completing and submitting the form below. If you are looking for a specif part number, please include it with your message.